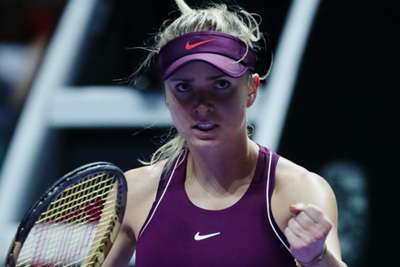 Elina Svitolina put herself on the cusp of the last four at the WTA Finals with a gritty three-set win over Karolina Pliskova in Singapore on Tuesday. The Ukrainian, who defeated Petra Kvitova in her opening White Group match, would have punched her ticket to the semi-finals with a straight-sets win. However, all four players – with Caroline Wozniacki having beaten Kvitova earlier in the day – now have a shot at progressing from the pool after Svitolina needed a decider to complete a 6-3 2-6 6-3 triumph. It was a deserved win for Svitolina, who rebounded from a mini dip in the second set to record a third straight win over Pliskova, having lost her first five career meetings with the Czech. Svitolina was under siege as early as game three and had to stave off six break points in a marathon 15-minute game. Pliskova's failure to nail one of those chances seemed to frustrate the Czech, who gifted Svitolina the first break in an error-strewn game six. That proved enough to take the opening set, but momentum was with Pliskova midway through the second when she broke to love out of nowhere, sealing the advantage with a sweetly struck winner. Another break levelled the match, only for Svitolina to regain her composure and race into a 4-0 double-break lead in the decider. Pliskova briefly stopped the rot before giving up another break in game seven when a wild backhand from the Czech went well wide. Svitolina failed to serve out for the match, but Pliskova again gave up her own serve to surrender the match, which finished with a punishing Svitolina forehand.